"Set in a dystopian universe, the film is set in a city—known only as The City—where singles are given 45 days to find a romantic partner or otherwise be turned into animals." Frightened? Intrigued? I was all of the above as I went to the theater not knowing what to expect. With a talented cast that gets the tone of the film and a director that is not afraid to tell his story, The Lobster is nothing short of a VERY interesting time at the movies. Greek director Yorgos Lanthimos paints the peculiar picture of a special hotel where single people are taken to where they are given 45 days to find a partner. Those who fail to find a match are turned into an animal of their choice and released into the forest. Self gratification is banned but sexual stimulation by the hotel maid (without completion) is mandatory. The guests of the hotel attend dances and watch various propaganda extolling the virtues of partnership. They can extend their stay by hunting escapees (a group of outsiders called The Loners) with tranquilizer guns in the woods. Each captured Loner affords an extra day to find a partner. Yes THIS REALLY is the plot of the film. It's so bizarre to watch and one can not help but be intrigued. Colin Farrell plays the lead role of David, a middle-aged man who is ending his marriage after his wife had been unfaithful to him. He checks into the hotel and meets other single people in similar situations including a hilarious lispy character played by the always amazing John C. Reilly. David tries to force himself to fall in love with an emotionless woman in an attempt to get back to the city and avoid becoming an animal. The title of the film stems from David's personal choice of animal should he not find love in 45 days. Towards the middle of the movie, David attempts to escape the hotel and live with the group of Loners on the outside. We meet two key characters during this portion of the film in the Leader of the Loners (Léa Seydoux from Spectre) and "The Short Sighted Woman" played by Rachel Weisz. David finds a suitable match in the latter and they try to fall in love despite all the rules of the Loners (different rules than the Hotel rules, but particular and strange all the same). All of the actors are great in this movie. Farrell is muted and nuanced almost like Joaquin Phoenix in Her. Seydoux is so intriguing to watch. She has this unique, beautiful face that pulls you in every-time she's on-screen. Weisz is not in the movie all that much but her narration pulls the whole film together. The film sort of falls apart a bit towards the end but I have to say that I was full-on engrossed in the story the whole time. I think part of the. Lanthimos is trying to give some sort of social commentary on modern-day marriage but I'm not sure I really got his message. That being said the entire movie is fascinating to watch. 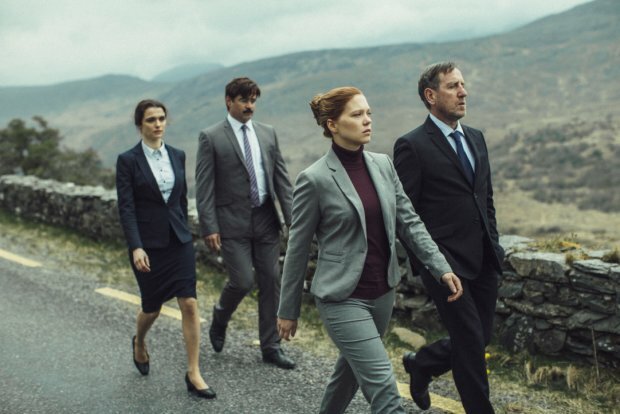 The Lobster is an extremely unique and strange film. The ending is so abrupt and slightly frustrating that it makes you angry at first but then sits with you for a while. I have been wavering back and forth between 4 and 4.5 for rating this movie. I finally decided to go with 4.5 simply because this film has just sat with me for a while since watching it a few days ago. Movies that stay ingrained in your mind deserve a little extra bump in rating. If you go see this, go in with an open mind and just have fun watching this wacky story unfold. Suspend all disbelief and enjoy the ride. We'll probably never see another movie like this. 4.5 out of 5 JRs for definitely the strangest movie of 2016 so-far. Two quick reviews today for films I've seen over the past week. 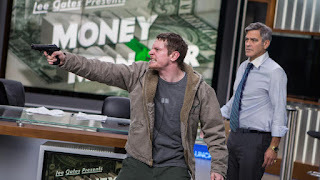 The first film I saw is Jodie Foster's latest directorial effort Money Monster, a film that looks at corruption on Wall Street through the eyes of a "terrorist" Kyle Budwell (Jack O'Connell) who hijacks a live stock-tip TV show (very much like Mad Money with Jim Cramer) hosted by the eccentric Lee Gates (George Clooney in a very hammy role). Budwell tells the American public through Gates' assistance that a fictional company has cheated stock holders during their recent dive in the market. Gates tries to work with Budwell to get to the bottom of things with the help of resourceful producer Patty Fenn (Julia Roberts). Clooney and Roberts have great chemistry here (picking up where they left off in the Oceans 11 franchise). It's easy to relate to them at the end of the film because we have so much history with them together as likeable actors. O'Connell is really good as a slightly psycho nutcase who just wants his money back that he lost in the fictional financial company's downfall. He was in Green Room as well and seems to be on fire after his breakthrough role in Unbroken. Roberts is solid in a "voice-in-the-ear" role and Clooney is pretty good overall but wears thin a bit. After seeing Hail, Caesar and now this effort, I'm wondering if Clooney's talents are slipping a bit. My biggest issue with the movie overall is how cheesy it is. The intro sequences for the Money Monster show (see example at right) feature two fly-girl type dancers who gyrate while Clooney's Gates tries to attempt some sort of hip-hop dance in a funny costume. I know this is supposed to be tongue-in-cheek but it comes off as tired and unneccesary. Watching George Clooney trying to be "street" is very painful. There are other plot issues and a bit of drag at times and it doesn't really seem like a typical Jodie Foster film. Still though this is an interesting take on financial corruption and a good look at behind the scenes production at a major network TV news show. The tension builds towards the end as Clooney and his hostage taker head to the streets of NYC trying to find direct answers from the source (think panicked CEO) to Budwell's questions. This is worth seeing but not necessarily on the big screen. A descent 3.5 out of 5 JRs for Money Monster. Jack O'Connell is going to be a star and I'm not sure how much Clooney has left in the tank. 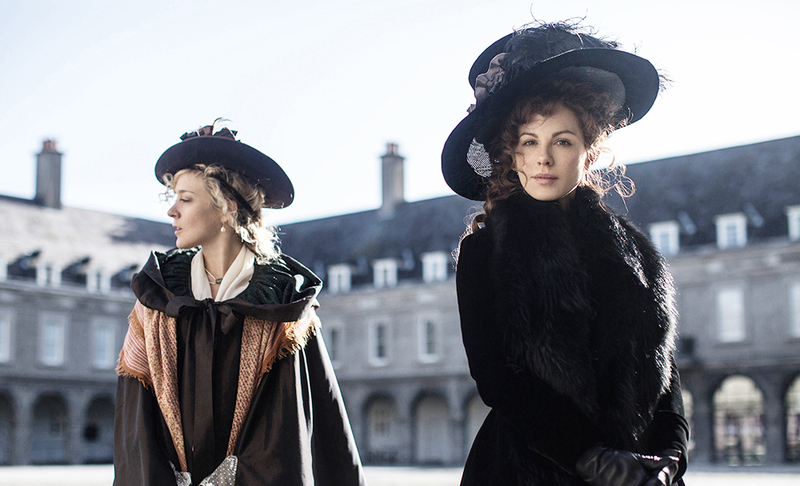 Love & Friendship is the latest Jane Austen story to get the big-screen treatment. Directed by Whit Stillman and starring one of my movie crushes in Kate Beckinsale and another who I can't really stand in Chloe Sevigny, this film tells the story of Lady Susan Vernon (Beckinsale), a recent widow who takes up residence at the estate of her in-laws and ends up trying to be a matchmaker for her daughter. I saw this movie at the request of my lovely wife so this is not the normal type of film I would see on my own. Still I have liked other movies like this much better (see Belle and Downton Abbey is interesting at times). I could just not get interested in this film and most every joke went over my head. I find it hard to focus on the language of that period, and all around me others (mostly older people) were chuckling left and right at a variety of on-screen puns. I only laughed once (at a joke about green peas) and spent the rest to the film unsure of what I was watching and trying to keep track of all the characters and their relationships to one-another. I would give this a 0 rating but I can't give anything with Beckinsale in it zero JRs (see Total Recall). I'm glad my wife liked it (but she was even lukewarm on the comedy aspects of the film and the fact that it was not a typical Jane Austen offering). If you like period pieces, please go see it. If you LOVE "funny" period pieces, please RUN and go see it. But if you like the type of movies that usually make my Top 10 list every year, please DON'T SEE THIS. 0.5 out of 5 JRs for one of the worst (based on personal preference) movies I've seen in years.